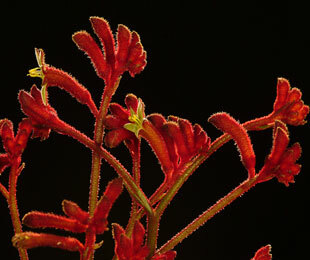 Ruby Velvet™ Anigozanthos is an attractive hybrid Kangaroo Paw with strappy leaves and stunning red flowers that reach 70 to 80 centimetres high, whilst its foliage reaches 30 to 40 centimetres. These high nectar producing flowers attract honey birds into the garden. Ruby Velvet™ Anigozanthos is frost hardy and will survive in full sun, well drained positions, or is ideal to plant into pots and tubes. 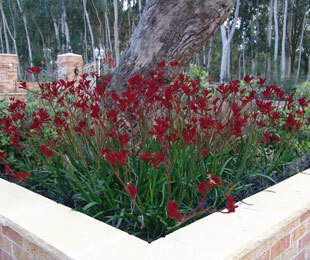 For best results, plant Ruby Velvet™ Anigozanthos with a slow release fertiliser for Australian plants. After flowering, remove the old flowering stems and leaves to encourage new growth and flowers the following year. Full sun open position Tolerates frost & drought well drained soils. This is the smallest Kangaroo Paw in the range. It will need planting closer together or used as explained in the ‘Amber Velvet’ tips for landscape mass plantings.